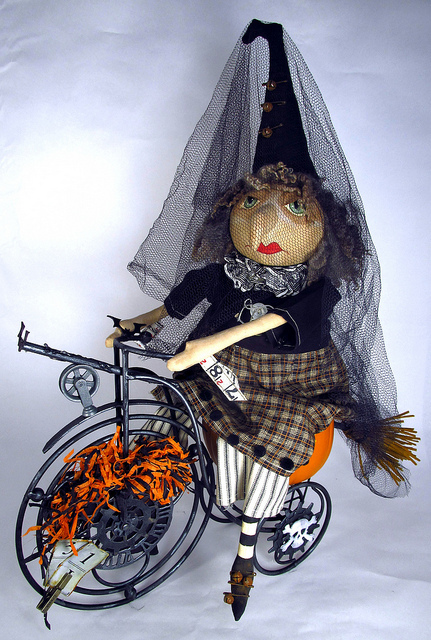 The Gentleman Crafter: Halloween Challenge/Decoration..Biking Witch! Actually, its afternoon for a few more minutes, but I couldn't help pulling out my Dracula voice! A while back Fiona Jennings of Jennings644/Freestyle-Crafts on YouTube sent me a HUGEEEEE box of treasures. Inside it she sent a metal tricycle with a note attached saying..."Here is a challenge for you...I want to see what you can do with this!" The first thing was to chop off the metal basket on back of the bike. Next, I painted the bike all black. I cut a craft pumpkin in half and stuck it down on the "spikes" left by cutting the basket off. I cut a bunch of Tim Holtz Alteration Dies...Clock, gears, bats and skulls. 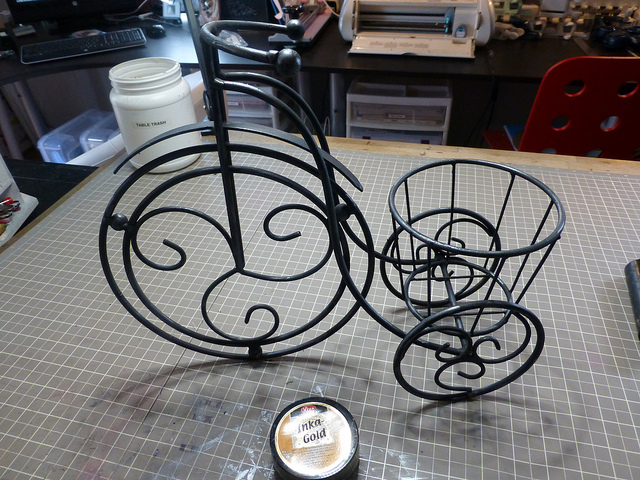 I glued them together and onto the bike. I then took some crepe paper and made a little fussy mussy or two around the clock just to add a bit of color to the larger wheel. I placed a couple of Tim's Cards on the wheel and attached with a Graphic 45 clothespin (remember doing that when we were kids!). I took a dowel and painted it black. Next, I applied hot glue all over the dowel and then went over it with the Viva Gold's Graphite (Thanks Fiona for that too! I love this product!). I cut thin strips of chipboard and bent them in half forming a broom. I sprayed the chipboard broom with Dylusions Pure Sunshine and Melted Chocolate spray inks. I attached them to the dowel with some black waxed string. That's it for now...Onward to create....Hope you are having fun looking...Be back in a bit! LOL ALICE! Gotta Love Ya! This is awesome! Love all the little gears but my favorite is how you used the pulley wheel! Sherry! A woman of my own heart! Thanks for noticing that! I loved that part! Great job Jim. She reminds me of the nasty neighbor in Dorothy's tornado. Hahahahha! She does doesn't she....LOL! "Sew" cute!!! Love the witch! 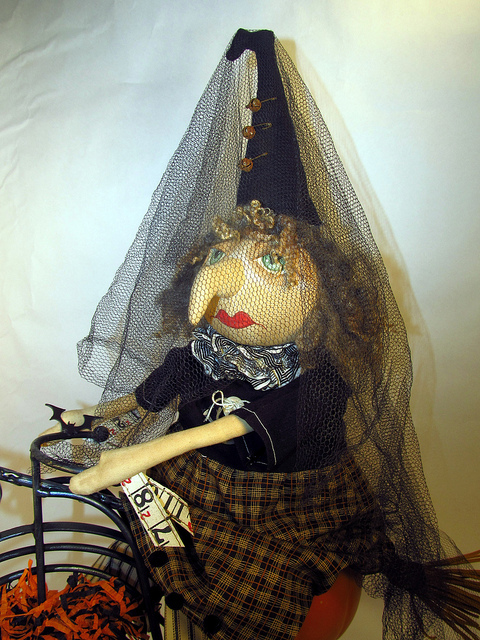 Agree with Wanda H...looks like the neighbor/witch in Kansas/Oz...even riding her bike. This is too FREEKINING cute! I LOVE it! You really are amazing. Great job! Wow. I can see these things sell like hotcakes. Don't you just hate when you only have 1? The cogs around the wheels are genious. Love her! You never cease to AMAZE !!!!! that is beyond amazing! love love love it! and your witch..too much. That's the kind of halloween decor I like and can never seem to get. You should go into business, sir!!! Toooooo cute! I love her! Great job Jim Fiona will be proud! Your witch has lots of personality! The challenge was certainly accomplished! Love the witch and her wheels!! Wonderful figure! Fantastic project! 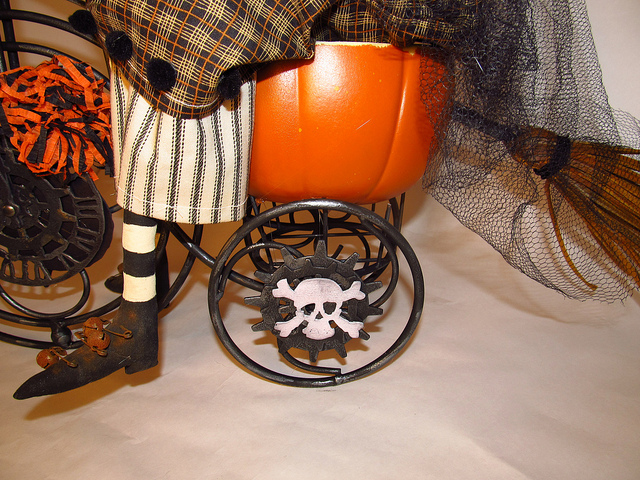 You almost make me want to decorate for halloween! Absolutely amazingly gorgeous!!! You are one clever man! And very talented. The stuffed figure you made is so full of life and character! Love the finished decoration... you'll cherish it for years I'm sure! WOWWEEEE this is fab! I want your doll lol (sorry figurine) she is brilliant! This is fantastic! Your imagination never ceases to amaze me. You amaze me...again, and again, and again! This is the cutest idea ever. I've been busy, busy...youngest son gets married in 13 days...not a lot of time for blog reading right now....but I was going through withdrawal, and had to check in with you. So glad I did! Wow, amazing, brilliant... So pleased I found your blog, you're very talented and provide us with such fun inspiration. Thank you! Wow super califrag....... what a witch. Your figure is perfect. you know to which witch figure I refer? GC you are just so talented. Another back of the net creation. great challenge looks nothing like it did at first. Can't wait to see the rest of the house what you come up with. Fantastic! Really turned out awesome! Shhhh...your not the only one with a secret, I used to sew stuffed "figures" too!...lol! OHHHHH!!! !Jim, she is so adorable, I love your stuffed "figure" isnt she just a sweet Doll(think like my daughter is just a doll) not the other kind of dolll....lol...this is my favorite item you have made so far but i reserve the right to change my mind...many times...thanks for sharing her, she is too sweet. OMG! 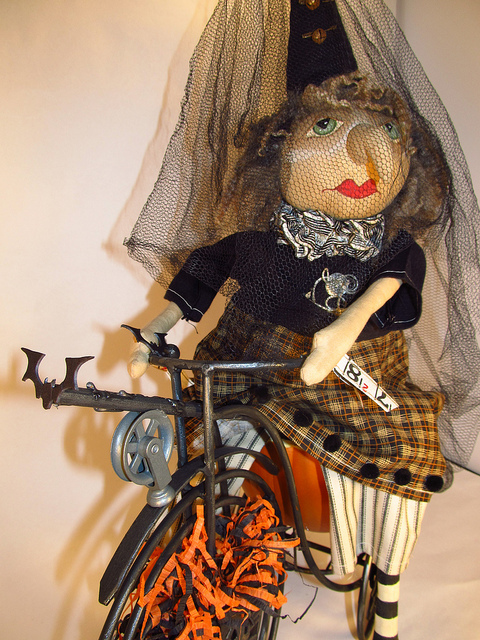 What an awesome stuffed figure Broom Helga is and the bike...well it has me speechless. Really fantastic piece. 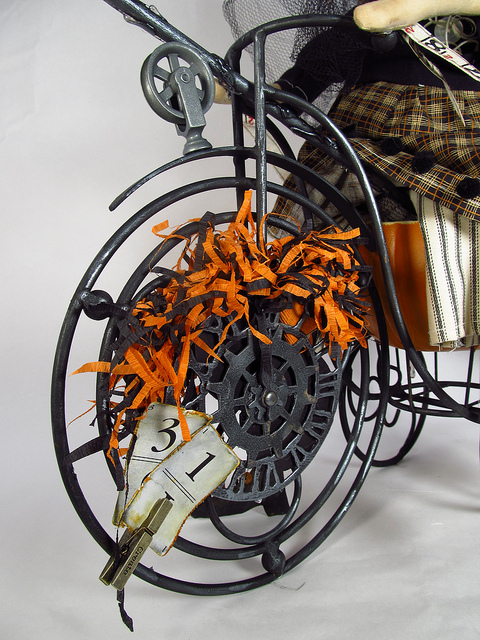 #31 for the bike spokes, skull for the back axel cover, tape for the handle bars, and the front wheel 'gears'... I think you met the challenge and then some! WOW!!! Your biker witch is AWESOME!!!!!!!!!!!! Jim, what a small world, I live in Bay City MI and know Joe Spencer, his sister is my x sister-in-law. He does make some incredible stuffed figures. How did you hear of him? what a nice bike and lovely witch. You did Fiona proud Jim. Helga is fantastic - so clever! Pure GENIUS!! I love her! Broom- Helga ... LOL ! Amazing... BUT not surprising... so very creative, love her "pimped out ride" ( all the Tim Holtzy goodness)!!! Jim: We are really kindred spirits.....we both made dolls in our past life (sorry, stuffed figures)! I love the witch on the cycle, using the pumpkin for a seat was genius. I think she is every bit as good as the other figures, great job on the face BTW! And your home is lovely. Maybe sometime you could do a tour for your fans. You are truly blessed. I just want you to know that this witch is WONDERFUL, she can ride on over here any time to stir the cauldron!!! Just make sure she doesn't get on the freeway!!! !Just sayin!!! And your little dog too !!!!!!!!!!!!! hhhhhhhhhhhhhhEEEEEEEEEEEEEEEEEEEEEEEEEEEEEEEEEEHHHHHH! Love it Love it Love it !!!!! Especially the green eyes! Why do all these witches have green eyes???? How spectacular to have so many friends!